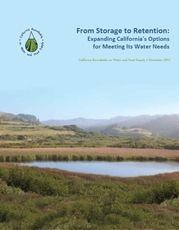 The California Roundtable on Water and Food Supply (CRWFS) released its latest report, From Storage to Retention: Expanding California’s Options for Meeting Its Water Needs. Pacific Institute’s agriculture and water expert Dr. Juliet Christian-Smith, also a member of the CRWFS, contributed to the newest report which builds on earlier work focused on agricultural water stewardship, and argues for an expansion of approaches to storing water that increase supply reliability for specialty crop agricultural production and other beneficial uses while protecting ecosystem health. Management approaches must support a broad range of options, including ecologically sound large-scale reservoirs, a patchwork of on-farm ponds, expanded soil capacity to retain water, and improvements in groundwater recharge, among others. The report highlights both a conceptual shift in water management that it argues is a necessary underpinning of effective water storage, and recommends a set of priority actions that constitute high-leverage opportunities to improve California’s water storage capacity and management. The Roundtable is grateful to the USDA Specialty Crop Block Grant Program, administered by the California Department of Food and Agriculture, and Gaia Fund for their support.